Clean elections candidate for Governor, Terry Hayes (center left) and Democratic gubernatorial candidate hopeful Adam Cotes shake hands with people arriving to vote at the Cross Insurance Centerin Bangor June 12, 2018. AUGUSTA, Maine — Bypassing a stalemated Maine Legislature, ethics regulators voted Thursday to effectively ignore a drafting error in state law that has locked away about $3.2 million in taxpayer funding for gubernatorial and legislative campaigns since July. 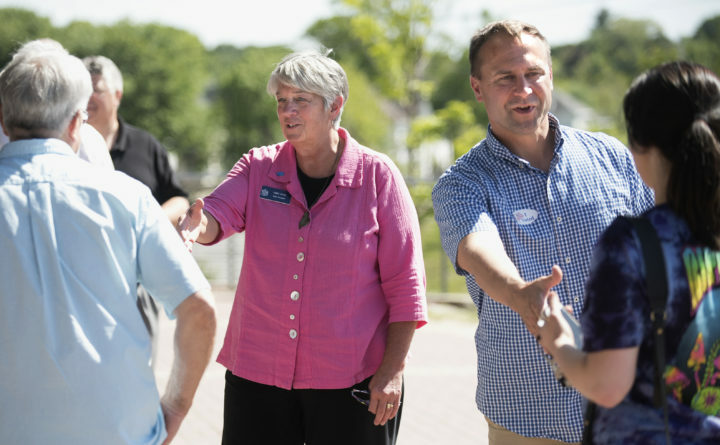 The 3-1 vote from the Maine Ethics Commission was an authoritative move for a restrained body that doesn’t often wade into hot political debates, though it was supported by a bipartisan group of lawmakers who have fretted that their 2018 campaigns may be at risk. Earlier this month, a judge ordered Gov. Paul LePage’s administration to release about $1 million in Clean Election money that the Republican governor tried to block in June by not issuing financial orders. That money was released last week despite bureaucratic tangles. But that ruling alone didn’t affect the larger pool of money in the fund for the 2019 fiscal year — which began July 1 — that has been perhaps the largest issue in a legislative session that continues months beyond a normally scheduled April adjournment debate. Republicans in the House of Representatives who are generally opposed to the Clean Election program created by Maine voters in 1996 and beefed up in 2015 have refused to fix the drafting error that has blocked the funds. House Democrats have blocked votes on a compromise bill to conform Maine to federal tax changes. This week, Maine Citizens for Clean Elections, a group that advocates for the law, told the ethics commission that the ruling from Superior Court Justice William Stokes — which held that the fund holds a special status under state law — should apply to the blocked pool of money and asked commissioners to release it. Commission staff largely agreed with the group’s argument. That led a majority of the four person commission to reopen the program to independent gubernatorial candidate Terry Hayes and approximately 200 legislative candidates. William Lee, a Waterville Democrat who chairs the commission, cited the “mandatory nature” of the fund. Senate Republicans and Democrats spoke in favor of that decision. Only Commissioner Richard Nass, a Republican and former state senator from Acton, voted against the reopening of the fund, saying “we are not the fixers” and the Legislature should be responsible for solving its own impasses. Hayes, who sat well behind Republican nominee Shawn Moody and Democrat Janet Mills alongside fellow independent Alan Caron in a Suffolk University poll of the governor’s race released last week, said she expected to lag at this point of the campaign, and that the fund’s return to normalcy will help voters learn about her.